The yellow "balls" growing on your oak leaves are abnormal growths of plant tissue called galls. Galls can also be found on other parts of the tree, including the branches, acorns and bark. Leaf galls may not look attractive, but they won't kill your tree. There are two yellow oak galls: the jumping oak gall and the woolly leaf gall. Jumping oak galls are yellow or brown blister-shaped balls the size of a pinhead. When the galls are mature, they fall off the leaves and bounce around on the ground like Mexican jumping beans. The bouncing is caused by movements of the larva inside and serves to move the gall into leaf litter or soil where it will overwinter. The woolly leaf gall looks like a fuzzy piece of wool or lint. It has a bright pink or yellow color, but it turns brown in the fall. Jumping oak galls and woolly oak galls are made by the larvae of tiny parasitical gall wasps that lay their eggs on oak leaves. The larvae of the wasp release a growth hormone as they feed on the oak, and this hormone stimulates the oak tree to form galls around them. The galls serve to protect the larvae from their natural enemies and to provide them with food as they feed on the tissue inside the gall. 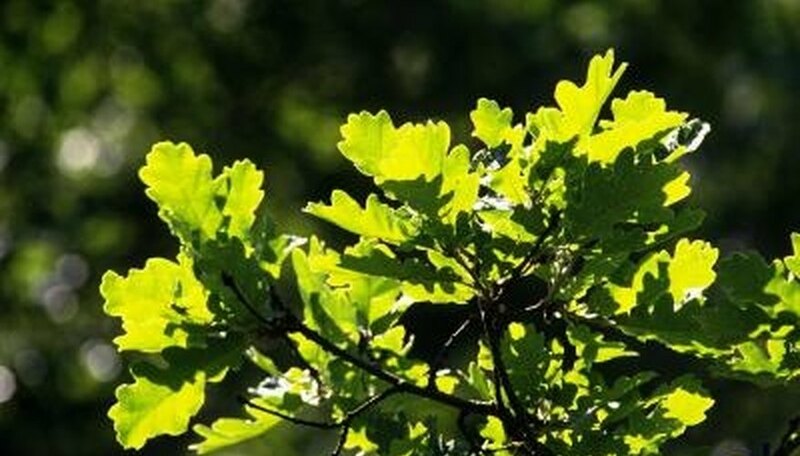 Jumping oak galls can cause oak leaves to turn brown in the spring, and often this is the first symptom of them. Severe infestations may even cause leaves to curl up and turn black before falling off the tree. The problem often lasts a year or two, before natural predators control the gallmaker population, and the health of the tree isn't usually impacted. Damage caused by woolly leaf galls is mostly aesthetic. Heavily infested trees may have discolored leaves that drop prematurely, but the overall health of an infested tree isn't impacted. Insecticides are usually ineffective against gallmakers, because the larvae are inside the gall where they're protected. Pesticides can be used on adults when they're laying eggs, but you need to know the specific insect you're dealing with before you can know which pesticide to use. Using insecticides will also kill beneficial insects, such as parasitical wasps that prey on gallmakers. Stressed trees are more susceptible to galls, so the best way to control them is to keep trees healthy with adequate amounts of water and fertilizer. Avoid injuries caused by lawnmowers and trimmers, and clean up fallen leaves where pests and diseases may be lurking. Texas AgriLife Extension; Gall-Making Insects and Mites; Carlos E. Bográn, et. al. Oregon State University: Do You Know What Galls Me?